One of the important aspects of owning a home is having the knowledge of how to keep it maintained to avoid costly repairs and serious damage. Over the years weather and use will wear down both the interior and exterior of your property. If you are able to practice preventative care on your home, then you will prolong the life of all of its systems and components. At least every six months or so, you should be performing an inspection of your property so that you can ensure that it is still functioning properly and safely. 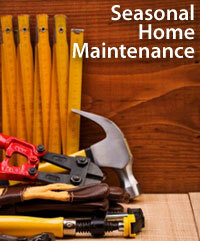 What should you be looking for when it comes to preventative home maintenance? Check your home thoroughly for any insects and unwanted pests such as carpenter ants and termites. Make sure that there is no point where the wood of your home is in contact with the soil and trim away and bushes and trees away from the foundation of the property. If you can catch the infestation right away, it could save you thousands of dollars on repairing future structural damage. Take a close look at the windows and doors of your home to see if you need to repair any leaks to save energy. A draughty door or window can really add to your energy bill over time, so it will be worth it to ensure that everything is sealed properly. Another important home maintenance task is to go around the exterior of your home and clean out all of the debris from your downspouts and gutters. This will ensure that they are draining properly and moving water away from the house. Otherwise, the water can collect on the eaves of the roof or around the foundation and cause leaks and damage. Make sure that you also inspect the roof at least every six months. Look for any loose shingles or damaged roof tiles. If you spot any damage early, it will be a lot less expensive to fix than the water damage that would be caused in your attic by leaving a leaky roof for a long time. These are just a few of the most important preventative home maintenance tasks that every Washington, DC property owner should know. For any additional questions regarding your home maintenance, feel free to contact your trusted local real estate professional. © 2010-2016 2 4 1 Construction. All Rights Reserved. All information provided is provided for information purposes only and does not constitute a legal contract between 2 4 1 Construction and any person or entity unless otherwise specified. Information is subject to change without prior notice. Although every reasonable effort is made to present current and accurate information, 2 4 1 Construction make no guarantees of any kind.